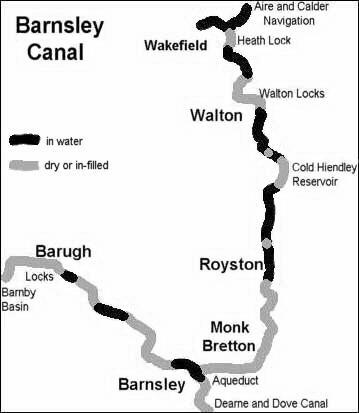 The Barnsley Canal ran for about 16 miles between Wakefield and Barugh, west of Barnsley, England. It is not open for navigation, although some sections are in water. The "journey" runs from north to south, but includes views of the canal looking in either direction. Click on the map or the links above to select an area or click here to take the whole virtual journey. If you enjoy the "journey" you can also take a virtual trip along the Dearne and Dove Canal.